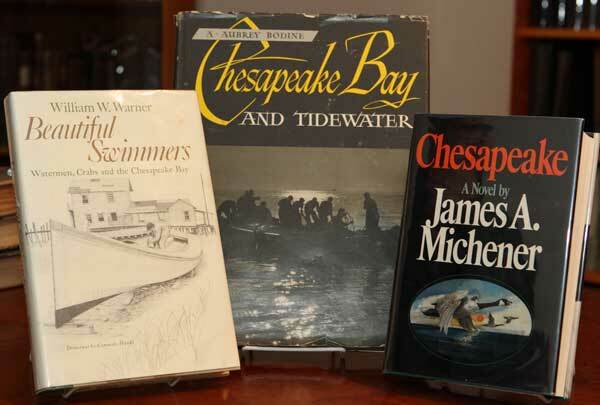 WARNER, WILLIAM W. “Beautiful Swimmers – Watermen, Crabs and the Chesapeake Bay”. Little Brown. Boston. Atlantic Monthly Press 1976. First Edition. VG- in a VG- DJ (previous tape marks from the DJ being taped to the covers present on both the DJ & boards. Winner of the Pulitzer Prize. Drawings by Consuelo Hanks. BODINE, A. AUBREY: “Chesapeake Bay and Tidewater” Hastings House. 1954 First Edition. SIGNED by Bodine. VG in a G DJ. 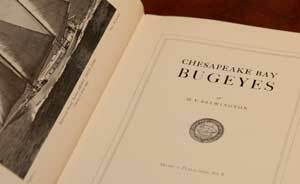 From the Jacket: “This is the first photographic study ever published of the historic Chesapeake and its fabulous country. It has been compiled by one of America’s most distinguished photographers.